When we adopted Coco almost 7 years ago, taking a day trip to New Hampshire to visit family was doable. As our family grew year after year, that was no longer an option. At that point, Lisa would make 2 trips to New Hampshire a year. I stayed home with the kids. In return, family would make day trips down to Connecticut 2 times a year. But, for reasons unknown, that came to a halt almost 3 years ago when Lisa made her last overnight trip to New Hampshire. On that morning, Lisa got up early as if she was going to work. We followed our typical Monday through Friday routine. But, when Lisa wasn't home to give our kids their second afternoon snack, they knew something was up. 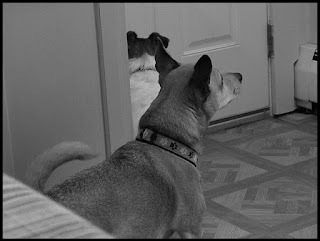 The kids ate their snack, but their ears were on high alert for the sound of Lisa pulling into the driveway. When it was time for dinner, Coco paced. Sophie didn't budge from the living room chair. Lobo was pacing from room to room, barking. I finally got them all to eat their dinner. Sophie ate hers on the living room chair. After we talked about this, Lisa and I agreed that she would not be making any more overnight trips to New Hampshire. Since then, Lisa has made 1 more daytime trip to New Hampshire. No one has visited us. Last week, a very dear friend of mine, Sue, passed away unexpectedly. We've been friends for over 20 years. I'm not going to lie, I took this news hard. This morning, during our morning coffee chat time, Lisa and I discussed how many family and friends we've lost over the past few years. It has been well over a dozen. While eating dinner, Lisa expressed wanting to make a day trip to New Hampshire. It caught me off guard, but I understood why. We talked about it and set a date. Lisa will be making the day trip alone. I'll stay home with our kids and work. That's the way it has to be and I am more than okay with that. Lisa has told me quite firmly that she will be reiterating that the road travels both ways. No one has made the trip down here in almost 3 years. That's far too long. There is no excuse. If we had human kids, would things be different? Planning for Lisa to make a day trip to New Hampshire requires a few weeks of planning. If we can do it, so can everyone else.